Jibilian is shown with Capt. 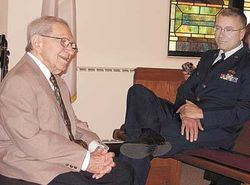 Gary Bentley (right) of the Ohio Air National Guard 180th Fighter Wing. Photo by MaryAnn Kromer. Navy veteran Arthur Jibilian lived in Tiffin and worked at Basic for 28 years. Now a resident of Fremont, Jibilian spoke of his harrowing experiences in the European Theater of World War II. Last month Jibilian addressed the Midday Fellowship at St. John United Church of Christ in Tiffin. Accompanying Jibilian were his wife, Jo, his daughter, Deborah Jibilian, and Capt. Gary Bentley of the Ohio Air National Guard 180th Fighter Wing. Jibilian gave some background information about himself and the situation in Europe at the time he served in the military. "In January 1942, I planned to go into the Naval Air Corps ... but they told me to come back later," Jibilian said. About that time, his father became ill, so Jibilian cared for him until he died. In 1943, at age 20, Jibilian was drafted and accepted into the Navy. When his superiors discovered he could speak Armenian, they decided to make him a radio operator. He went to Ft. Benning, Ga., for parachute training and army maneuvers. Intelligence training took another two months. In the fall of 1944, Jibilian was involved in a secret operation to rescue U.S. airmen who had been shot down during bombing runs on oil fields in Romania and stranded in Yugoslavia behind enemy lines. Because of its classified status, the mission that saved more than 500 men could not be revealed. 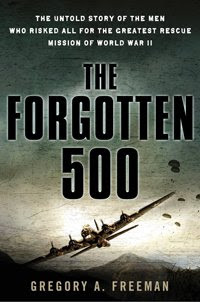 The story of Operation Halyard finally was told in "The Forgotten 500: The Untold Story of the Men Who Risked All for the Greatest Rescue Mission of World War II." The book by Gregory A. Freeman was published in 2007. 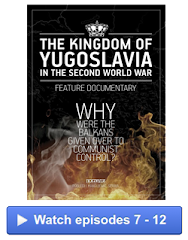 "When World War II broke out, Germany invaded Yugoslavia," he said. "The oil fields (in Ploesti, Romania) were prime targets of the Allies." American pilots were assigned to fly out of Italy to bomb the German-held oil fields in an effort to cut off fuel supplies for the Nazis. Jibilian said each plane carried 10 men, and about a third of the aircraft were shot down. Those who were able to parachute out of the falling planes were in danger of being killed or taken prisoner. 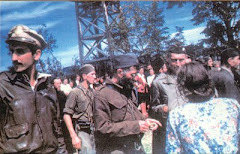 The Office of Strategic Services, the forerunner of the CIA, wanted to bring back the men on the ground in the Yugoslavian countryside. The American military discovered an unlikely ally in General Draza Mihailovich. 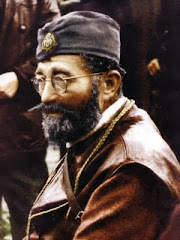 He was the leader of a Serbian resistance movement that wanted the Germans out of their country. "General Mihailovich put out a decree to protect (the Americans) at all costs," Jibilian said. 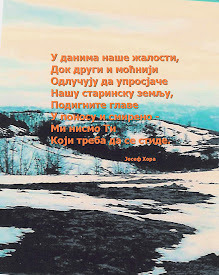 As a result, the Serbian peasants, who were dealing with many hardships of their own, risked their lives to hide the American men until a rescue could be organized. 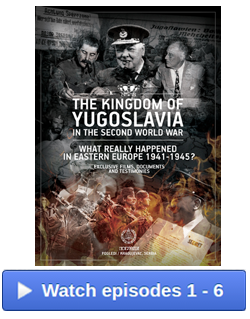 The British wanted the U.S. to stay out of Yugoslavia and would not permit flights from British-controlled air strips. Jibilian volunteered to parachute behind enemy lines to set up radio communication. The OSS organized a team and worked with Mihailovich to formulate the secret rescue plan. The evacuation had to be done in daylight because of the rugged terrain. Directed by the American intelligence, the Serbians used oxcarts to build an air strip surrounded by woods, working mostly at night. Other team members coordinated the movement of all the airmen to the landing strip. American C-4 cargo planes with fighter escorts were to fly in and load up as many airmen as possible. What began as a 10-day mission turned into six months. In all, 513 U.S. airmen and a few from other Allied countries, were airlifted to safety with no casualties or losses. Ironically, Mihailovich, who had made the rescue possible, did not fare so well. 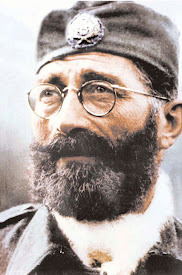 He had turned down a safe exit from Yugoslavia so that he could stay with his people and continue to sabotage the Germans. A new leader, General Tito, came to power and gained the support of the Allies. 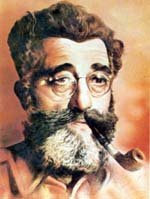 Tito captured Mihailovich and put him on trial. In spite of Mihailovich's life-saving efforts, the U.S. did not defend him. Jibilian was among a group of 20 airmen who went to Washington to stand up for Mihailovich and clear his name. Ignoring their efforts, the Yugoslavians declared the matter was an "internal affair" and executed the man who had facilitated the survival of hundreds of American military. "Flash forward now 60 years. 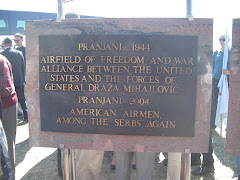 In 2004, I got an invitation to go back to Serbia and help dedicate the airfield," Jibilian said. Although the ceremony in 2005 did not get much publicity, Jibilian said the Serbian people lined up to shake his hand and show appreciation. The delegation also was able to present Mihailovich's daughter with the Legion of Merit Medal issued to her father in 1947. Betty Deason, who had invited Jibilian to speak, asked about a photograph in the book that depicts some of the rescued pilots with cloth sacks over their feet. Jibilian said the men wanted to leave behind their footwear for the use of their benefactors. Deason recommended the book to those who had not read it. After Jibilian's presentation, his daughter, Deborah Jibilian, spoke about other events her father has attended. In 2008, the Experimental Aircraft Association Chapter 582 at Metcalf Field learned about her father's role in the rescue of pilots in 1944. The EAA and the 180th Fighter Wing teamed up to recognize Jibilian on Flag Day, June 14. "They had a fly-in last June to honor Dad. ... They had a whole day of festivities. They brought in B-17s. It was wonderful," Deborah said. The EAA also invited Jibilian to the annual fly-in at their headquarters in Oshkosh, Wis., this August. When the honoree questioned all the attention he was receiving, the airmen said pilots are a brotherhood that recognizes anyone who helps one of their own. Deborah said Ohio politicians and the 180th also honored her father Dec. 7, 2008, when Jibilian received a Congressional award. "It was the first time the U.S. Government had acknowledged Mihailovich. This was phenomenal for Dad. In January, we were so honored that the 180th did cross training with the Serbs. The Serbs come here and train with the 180th, and the 180th goes to Serbia and does training. There were two pilots and two mechanics that were here," Deborah said. 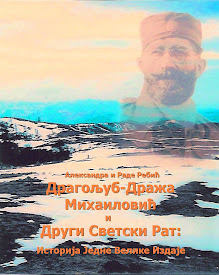 At a dinner with the Serbian Air Force and the 180th, the Jibilians took a copy of Freeman's book and showed the photographs to the Serbian men. 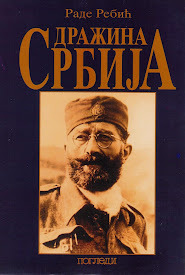 In spite of the language barrier, the Serbs were able to understand the young military man in the pictures was the same person who was having dinner with them. "About two weeks later, the general sent Dad a letter opener sword that all Serbian pilots are given when they get their commission," Deborah said. "Several of the pilots that were rescued that actually have kept in touch with the families that were their benefactors." 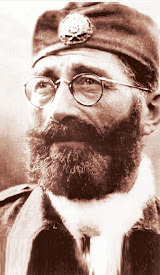 Even before "The Forgotten 500" was published, Jibilian was giving talks for school groups, churches and organizations in an effort to narrate the story of Mihailovich's heroism, which was covered up for many years. Deborah said Oliver North interviewed her father more than three years ago, but the interview was never broadcast or printed. "He's been recorded for the Library of Congress and at the University of Toledo. ... The genealogy department at Toledo is doing a search on all of the rescued guys," Deborah said. "That's part of a nationwide search the university is doing."